Well, this is a bit later than promised in our prior posts Brewing a White Stout – The Inspiration and Brewing a White Stout – The Recipe. After having some computer problems (failed hard drive), I finally got the rig running again and found a little time to pour myself a glass and sit down and share the results. Overall, I’m very happy with this beer. I chose to put it on nitrogen this time to give it that thick, rich and creamy mouthfeel. After having had a few pints of this beer, I can say that it will definitely be something that we brew again. The beer pours as a Guinness or Boddingtons would – rich and thick with a creamy off-white froth that cascades down the inside of the glass. As the head settles, it begins to turn from tan to white and giving way to a rich golden yellow beer. When poured from a nitro tap, this beer looks very similar to a Boddington Pub Ale. That’s where the similarities end. The white stout picked up a huge amount of aroma from “dry hopping” with whole coffee beans. 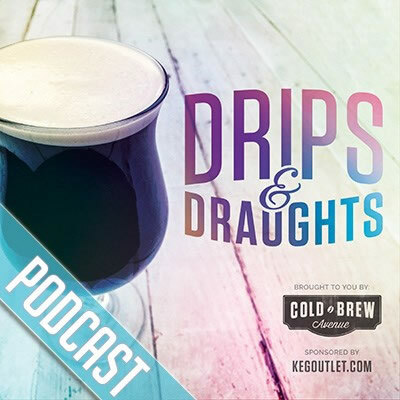 To be honest, I wasn’t 100% convinced that we could get enough coffee taste and flavor from adding whole beans to the fermenter for a day or two, but after talking with Brent from The Single Hop about his Coffee Pale Stout, we decided to give it a go. I’m glad we decided to use whole beans for two reasons. I’ve used coffee grounds in stouts before and it yielded an undesirable result that I couldn’t quite put my finger on. It gave the beer a bit of a tanginess and/or acidity. I’m also glad that we didn’t use a coffee concentrate, as that would have contributed color to the beer making it much darker than it turned out. I don’t think I mentioned the type of coffee beans that we used in the previous posts. We ended up using 1lb of Colombia Supremo ‘La Valle Verde’ from Cold Brew Avenue. I had tried this coffee a few weeks prior to brewing the white stout and fell in love with it. Amazing flavor. The froth settles quickly to leave a perfect head on the beer. The aroma of this beer is second to none, and while I have a slight idea of what to expect, it always catches me off guard. Watching friends smell this beer for the first time is always entertaining. They always go back for the double take. “Smells kinda roasty. Is that… coffee?”, they’ll ask. The taste of this beer is exactly what you wouldn’t expect from looking at it, and again causes people to go back for the double take. “Wow” is probably one of the most common descriptions that I’ve heard. “I wasn’t expecting that. Even after smelling it.” The flavor is full and rich, plenty of coffee and chocolate, plus there is a decent amount of smoke and roasted flavor from the smoked malt and barley. As far as mouthfeel goes, it is thick, rich and smooth as you’d expect from a beer on nitro. It got decent body from the flaked barley and oats. Next time we brew this beer, I plan on using CO2. The White Stout that I tried at Track 7 Brewery was served on CO2 and provided an entirely different experience than ours. I’m interested to see how the large amount of flaked oats and barley pair with light carbonation. Overall, this was a fun beer to brew. From coming up with the recipe to brewing it and especially coming up with our schedule and method to add the cacao nibs and coffee. Is this a beer I’d like to have on tap year round? Honestly, no. Especially now, getting into the warmer months in Southern California, this is not a beer for hot days. Though it is a balmy 65F today, I might have to pour one of these for myself tonight. This beer is too rich and too heavy for sippin’ in the sun. It begs for a cold night. I appreciate all the comments and feedback I’ve received, via social media, email and comments here. To those who have contacted me saying that they are going to or have already brewed this, let me know how it turned out, and feel free to send me a bottle.